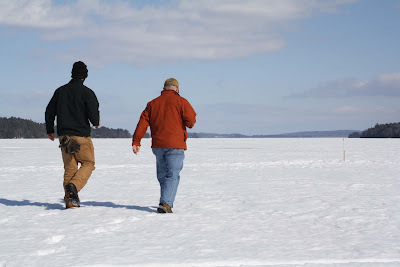 Ice Fishing on Great Pond in Kennebec County. The fish refused to bite but beautiful blue skies and the warmest day in as long as I can remember added up to pure ice fishing NIRVANA! Yes sadly, sometimes the fish win! Always great to be outdoors and in the zone. We got skunked also, the hot spot didn't produce at all and my little one decided that the fish were somewhere else. But what a day, little windy but so warm! Mel, That why they call it fishing and not catching! LOL!